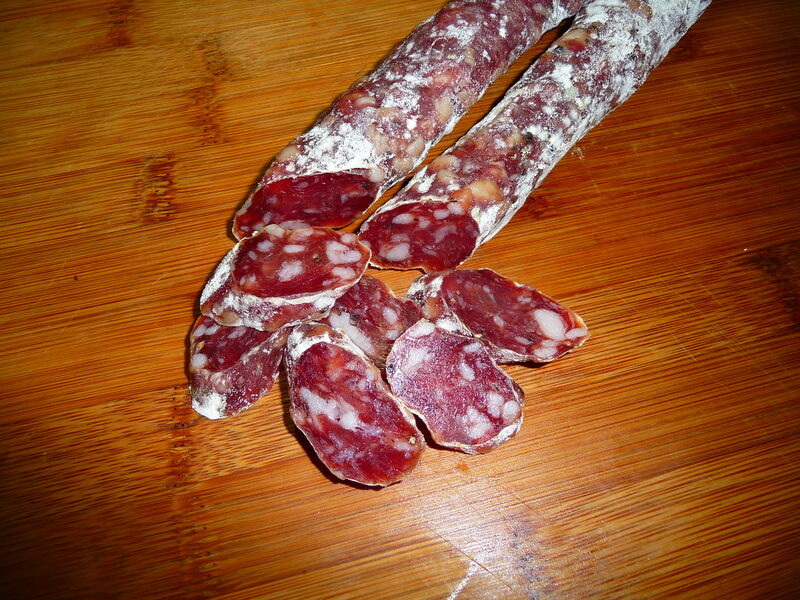 Here is an easy French dry cured sausage recipe that everyone can make. No starter cultures needed, and at this time of year you can get by without a curing chamber. If you have a cellar, an unheated basement or even a garage that does not freeze, you can make this sausage. Give it a shot and amaze your friends at Christmas! 1. Cube meat into 2-3cm pieces, semi freeze and grind though the 7 or8mm plate. 2. Add the salt, cure and sugar into the ground meat, mix, load into a covered container and place into the fridge for 3-4 days. 3. Add the rest of the ingredients and the liquor and mix well, mut don't over mix or allow the batter to get warm to avoid fat smearing. Return to fridge while setting up the stuffer. 5. Mature/dry at a temp of 8-15C (47-59F) and RH of 60 or higher. 6. The saucisson will be ready to eat in 2-4 weeks, depending on your drying parameters and personal tastes. Don't wait until it is rock hard, the French consume this type of sausage while it is still quite soft. redzet, this sausage looks very nice and it is easy to make! I am just wondering: if this sausage suppose to stay in curing chamber for up to 4 weeks, why not to use cure 2 instead of cure 1? This is literally dry curing without a fermentation process.... Am I missing something here? Thank you! I was looking for a little something for christmas open house gifts. This is it. Only 2.5% total salt ? bolepa wrote: redzet, this sausage looks very nice and it is easy to make! I am just wondering: if this sausage suppose to stay in curing chamber for up to 4 weeks, why not to use cure 2 instead of cure 1? This is literally dry curing without a fermentation process.... Am I missing something here? Thank you! If you make the sausage in narrow gauge casings, dry at an RH less than 80%, it will be ready before in less than 4 weeks. I don't recommend making it in casings larger than 42 without proper acidification and controlled temp and humidity. And yes, it is essentially a dry cured and non-fermented sausage. Although there is probably a degree of lactic acid activity and a small pH drop due to the sugar addition. Bob K wrote: Only 2.5% total salt ? Good point, 2.8% might be better for safety reasons as salting and nitrite are the main hurdles here. 2.5% is considered as the minimum standard in dried cured sausages. Thanks BB! Actually the photo turned out better than the sausage looked through the naked eye. The colour has been intensified with the flash my camera. redzed, thank you for explanation! Redzed, what if you wanted to try this same recipe but not as soft as the French like it, and wanted it a little drier, for example, 1-2 extra weeks in chamber. Let`s assume we will be doing everything exactly as stated above with a 5.5-6 week dry time at 77% humidity. Would it still be acceptable not adding a culture and hanging dry sausages directly into drying chamber after stuffing? The reason I ask is I know many old Italians here in my county who do this very same thing. They make their sausages using old traditional recipes, add a lot more red wine then you would normally add, stuff and hang to dry. No elevated temps for first couple days to ferment, just straight into their basements holding 55*f and 75-80% humidity. They typically take 5-6 weeks to dry and always turn out fantastic. They use 38-42mm casings, use cure#2 and appropriate amount of salt, and as stated above, ALOT of red wine. 1/2 cup per 1000 grams to be exact. I was very interested reading this post because other then the wine vs cognac, your recipe and procedure is EXACTLY like theirs. Redz, you must have had me on your mind when you posted this, I love it, sounds like delicious fun, a must try, thanks you! 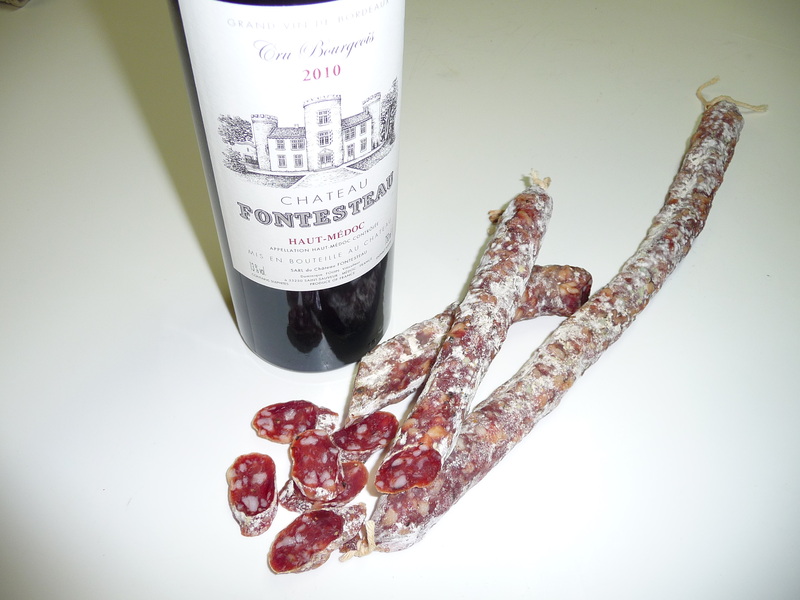 STICKSTRING wrote: Redzed, what if you wanted to try this same recipe but not as soft as the French like it, and wanted it a little drier, for example, 1-2 extra weeks in chamber. Let`s assume we will be doing everything exactly as stated above with a 5.5-6 week dry time at 77% humidity. Would it still be acceptable not adding a culture and hanging dry sausages directly into drying chamber after stuffing? Should be no problem, just make sure you cure the meat for the 3 or 5 days first. During that time the salt and nitrite will lower the water activity and the pH will be lowered slightly. Essentially this is a dried and matured sausage where we don't count on acidification for safety or flavour. The flavour development will be the result of enzymatic activty and changes in the structure of the proteins. You can dry it for as long as you want. Your Italian friends are very liberal with the wine! Half a cup in American measurements is 118ml per kilogram and that is quite quite high. I add 25-30ml, and would never go over 50ml. Defeats the purpose of trying to make a dry sausage but first saturating it with liquid. In the older times wine was added as as much as an antimicrobial as for flavour. The salami was also salted a lot more, at 30-40g/kg. I have seen old recipes with as much as 50g/kg. I use cultures in my dry sausages because I have a wife and 2 kids and feel safer doing so. Although their traditions for making their dry sausages have always intrigued me! I have made their venison dry sausage once their way, and it came out perfect, although I questioned every bite and felt uncomfortable watching my kids eat it! Life provides enough stress, why add to it! I`ve questioned them in regards to their Heavy amounts of wine and they told me the wine serves multiple purposes in their dry sausages. It provides acidity, protection while meat cures, and flavor. I asked for a further explanation but did not receive. I truly believe they do not know why or how, they add the amounts of wine because that`s what they were taught by the last generation. It seems to work because every year about 6 or 7 families fill their basements with beef / pork , and venison / pork dry sausages using these methods and everyone is happy and alive. Any facts / truth to their old methods? I made this recipe / formula back in November for Christmas gifts. It was such a hit with guests and friends my second batch is coming out in a week. The flavor was subtly sweet and the mace comes through at the finish. The addition of sugar in this recipe, is it merely for flavor? Without the elevated temperatures to ferment I would have to assume there is very little to no fermentation going on. Thanks redz, I am definitely gonna give this recipe a try, looks great.